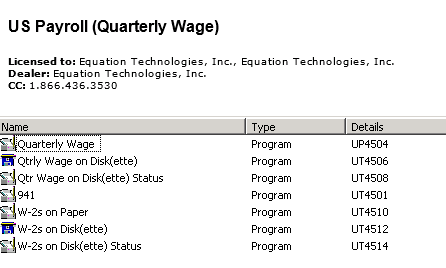 In prior versions, the Payroll Government Reports section would resemble the first image. 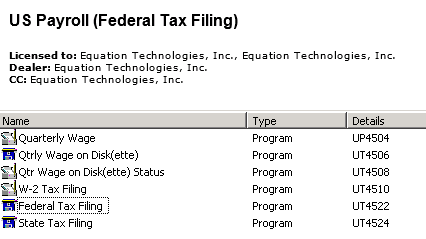 Most notably, the Federal Form 941 has its own icon. 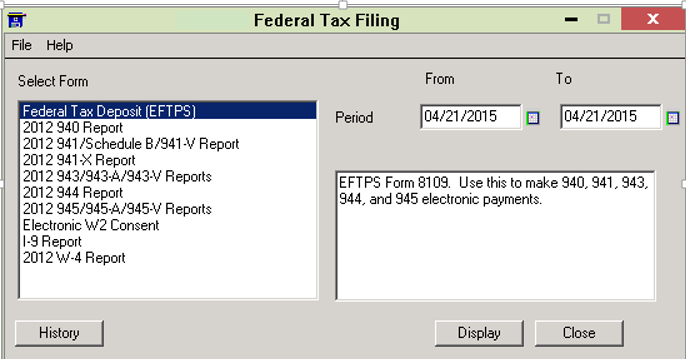 To access the 941 and other Federal Tax Forms (including W-2s), simply click on the Federal Tax Filing Icon and choose from a list of report and form options. In the example below, the client will need to update their forms using the Aatrix “Automatic Update” button (access by clicking the “Display” button) before the reports will reflect the current tax year. An exciting new feature included with the latest Payroll updates is Sage Payroll Tax Forms and efiling by Aatrix. This functionality provides updated reports and forms at no cost and enables users to fill out and e-file tax forms for a fee. Electronic filing is available for W-2, W-3, U.S. Federal Forms (941, 943, 944, and 945), U.S. State tax forms, and new hire reporting by state. Users can continue to run and print payroll reports and forms for free with confidence that they are using the most recent versions available. Clients accustomed to printing and mailing tax forms should make sure that they are aware of form requirements prior to ordering paper stock. For example, W-2s must be printed on Laser W-2 4-Up Blank with backer on all 4 panels. If you would like more information on the changes to Government Reporting and Tax Filing in Sage 300 Payroll, or need to make sure you have access to the latest payroll update, please contact Equation Technologies today.